Nifty opened positive but saw the sellers taking control with each small up-move being sold. The index ultimately closed very weak at 5833.20, a huge loss of 49.05 points. On a week on week basis the index lost huge 178.90 points or approx 2.98%. The broader market was just negative, with 596 advances to 712 declines. The range developing for the new series is still around 5700-6100. 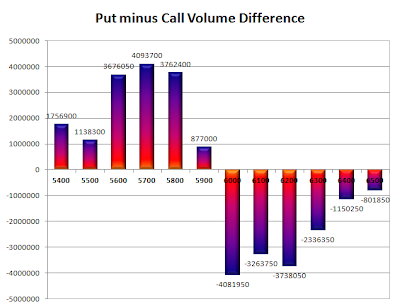 Call option 5900-6300 added 16.14 lacs huge amount of OI with small short covering seen at 5600 and lower strike prices. Put option 5900-5500 added 10.65 lacs huge amount of OI with small short covering seen at 6100 and above strike prices. 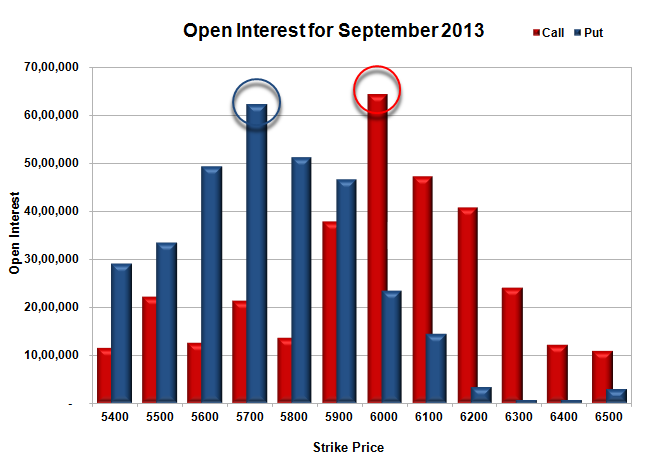 Nifty Open Interest is at 1,79,36,650 down by 1,54,450, with decrease in price, most probably huge long liquidation. 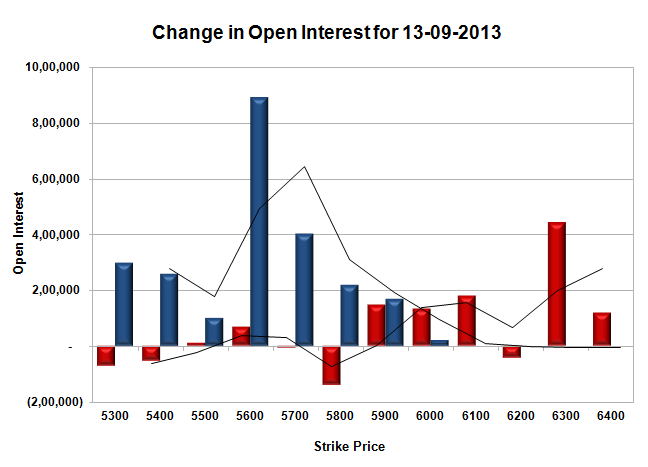 Bank Nifty Open Interest is at 15,65,700 up by 1,22,900, with decrease in price, most probably huge short build-up. FII’s sold 4.43 lacs Futures, mostly short build-up, as their net OI increased by 2006 contracts (includes 39941 longs and 48809 shorts) and the average price per contract comes to around 5776.54. FII’s future open contract as on date is 448554. PCR Open Interest (Volume) just increased a bit to 1.258. Support still very much at 5800, with OI of 33.17 lacs, below that at 5700, with highest OI of 38.00 lacs. 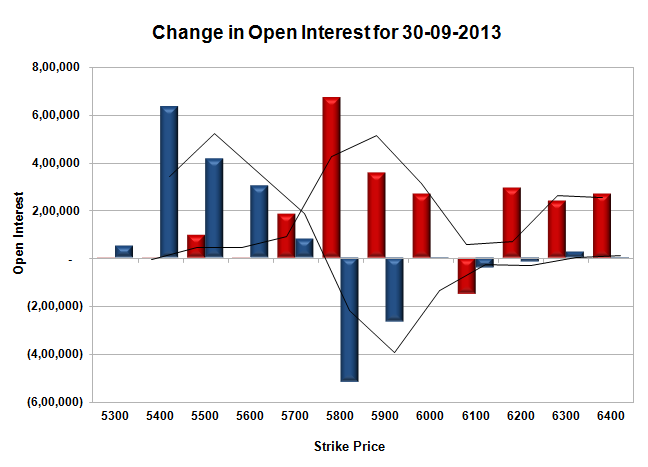 Initial resistance now at 5900, with OI of 23.62 lacs, above that at 6000 with OI of 31.01 lacs. Day Range as per Option Table is 5763 - 5933 and as per VIX is 5760 - 5907 with 5854 as the Pivot. Nifty opened flat and stayed in a very narrow range of 30 points for the better part of the day with a small up-move in the latter half being sold. The index ultimately closed just above the previous day at 5882.25, a small gain of 8.40 points. The broader market was positive, with 685 advances to 588 declines. The range developing for the new series comes around 5700-6100. Call option 5400-6500 added 42.99 lacs huge amount of OI. Put option 6500-5400 added 39.80 lacs huge amount of OI. Nifty Open Interest is at 1,80,91,100 up by 44,08,050, with not much change in price, most probably long/short build-up. Bank Nifty Open Interest is at 14,42,800 up by 2,03,800, with small increase in price, most probably huge long/short build-up. FII’s bought huge 25.18 lacs Futures, mostly short covering, as their net OI decreased by 228621 contracts (includes 232304 longs and 181954 shorts) and the average price per contract comes to around 5844.57. FII’s future open contract as on date is 446548. PCR Open Interest (Volume) at start of series is at 1.244. 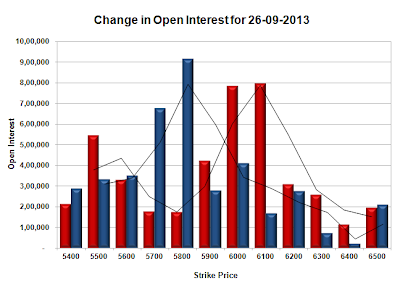 Initial support developing at 5800, with OI of 31.51 lacs, below that at 5700, with highest OI of 35.34 lacs. 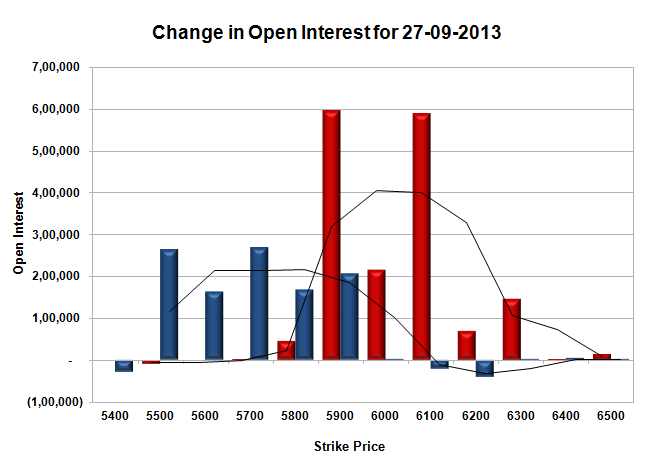 Initial and best resistance at 6000, with OI of 28.86 lacs, above that at 6100 with OI of just 24.46 lacs. 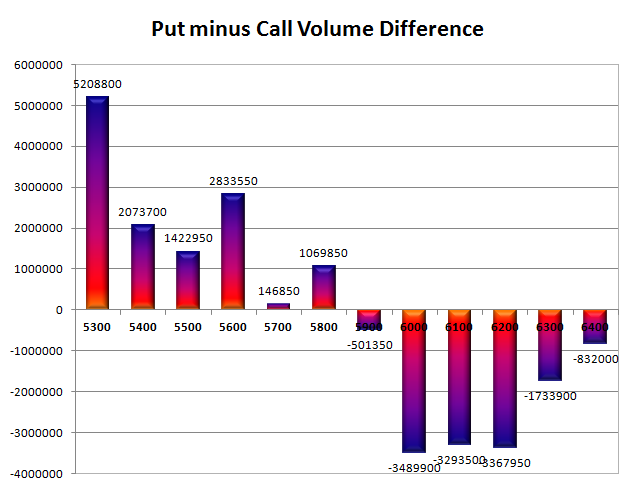 Day Range as per Option Table is 5799 - 5975 and as per VIX is 5808 - 5956 with 5888 as the Pivot. 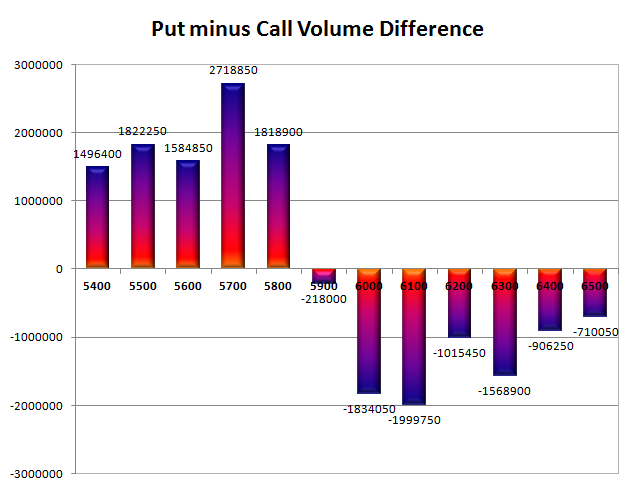 Nifty opened weak below 5950 and after a small up-move towards 5990 was sold off huge below 5900 level. The index closed weak at 5889.75, a huge loss of 122.35 points. Nifty had a back-to-back 100 points plus loss in the last 2 days. The broader was also negative, with just 479 advances to 849 declines. 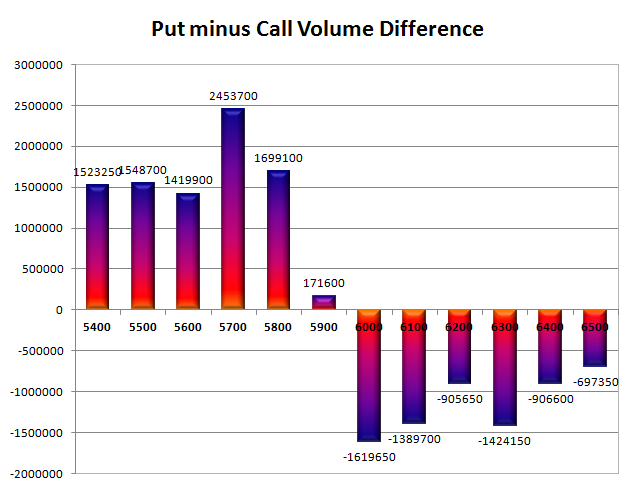 The Option Table range till expiry comes around 5800-6000. Call option 5800-6200 added 46.94 lacs huge amount of OI with profit booking seen at 6300 and above strike price. 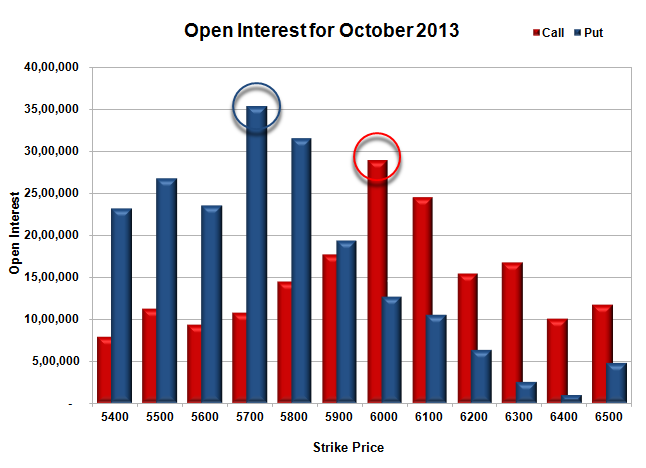 Put option 5900-5700 added 25.88 lacs huge amount of OI with short covering seen at 6000 and above strike prices. 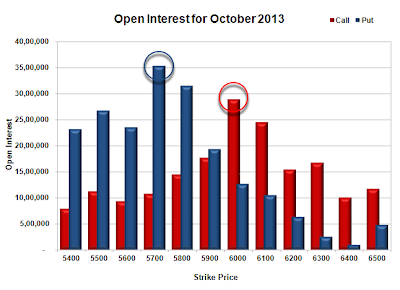 Nifty Open Interest is at 1,47,11,900 down by 2,12,350, whereas October series added 18.75 lacs, with decrease in price, most probably 100% rollover with huge short build-up. Bank Nifty Open Interest is at 15,91,375 down by 36,900, whereas October series added 1.89 lacs, with huge decrease in price, most probably 100% rollover with huge short build-up. FII’s sold 2.19 lacs Futures, mostly short build-up, as their net OI increased by 77510 contracts (includes 132825 longs and 137209 shorts) and the average price per contract comes to around 5821.52. FII’s future open contract as on date is 601146. 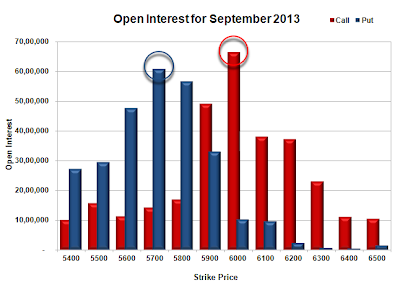 PCR Open Interest (Volume) has gone below 1.5 after many days and now at 1.488. 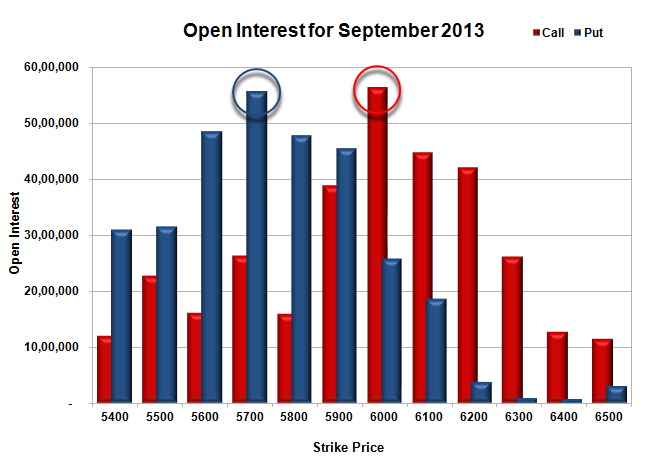 Support now at 5800, with OI of 47.82 lacs, below that at 5700, with huge OI of 55.69 lacs. 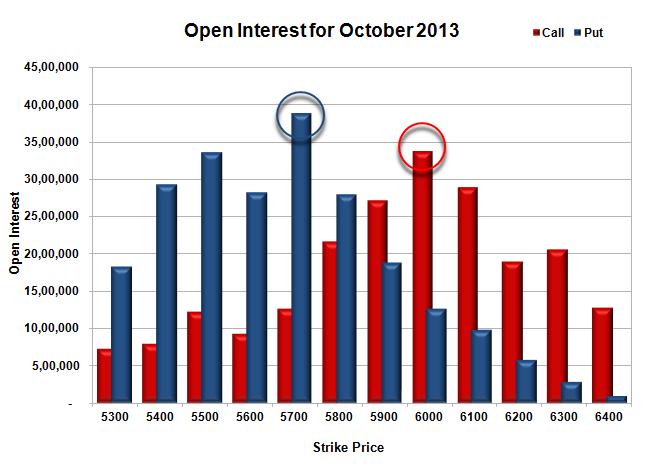 Best resistance is at 6000, with highest OI of 56.36 lacs and above that at 6100 with OI of 44.80 lacs. 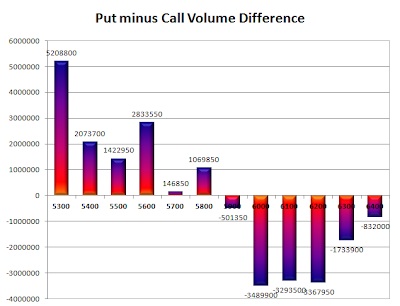 Day Range as per Option Table is 5805 - 6014 and as per VIX is 5806 - 5973 with 6025 as the Pivot. Nifty opened huge gap-up on Fed move of no tapering for the time being and rallied higher and higher with each passing hour to the highs of the day at 6142. A small profit booking towards the end of the day saw the index close at 6115.55, a huge-huge gain of 216.10 points, a second 200 pointer in this month for the Bulls. 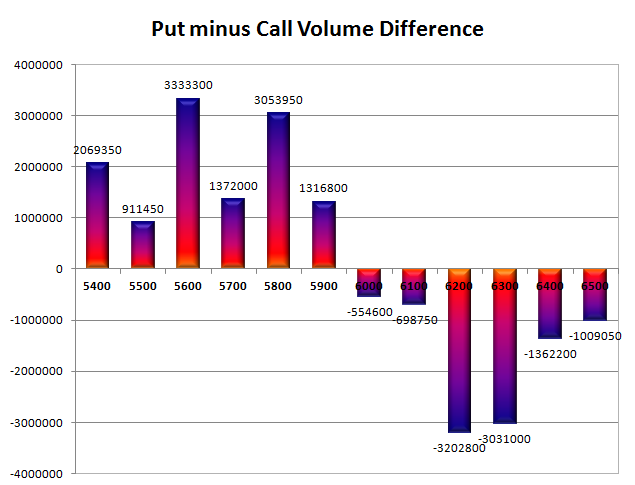 The broader was also very positive, with 911 advances to 434 declines. The Option Table right now is in full control of the Bulls. Call option 6200-6500 added 19.71 lacs huge amount of OI with short covering seen at 6100 and below strike price. Put option 6200-5900 added 63.74 lacs huge amount of OI with profit booking seen at 5800 and below strike prices. 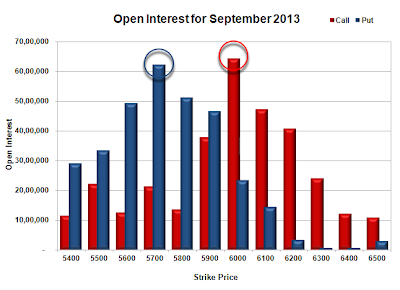 Nifty Open Interest is at 1,62,04,200 up by 5,42,600, whereas October series added 13.59 lacs, with increase in price, most probably huge long build-up. Bank Nifty Open Interest is at 18,51,525 down by 1,55,650, with huge increase in price, most probably huge short covering. FII’s bought huge 49.90 lacs Futures, mostly long build-up, as their net OI increased by 60902 contracts (includes 196750 longs and 96948 shorts) and the average price per contract comes to around 6073.36. FII’s future open contract as on date is 513513. 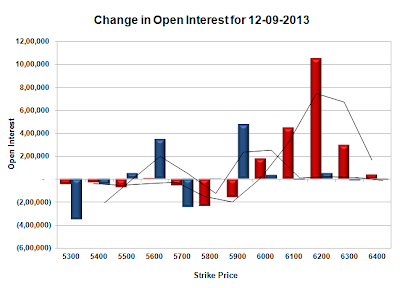 PCR Open Interest (Volume) has moved up at 1.691. Initial support has jumped up at 6100, with huge addition for the day at 28.69 lacs, below that at 6000, with huge OI of 41.94 lacs. 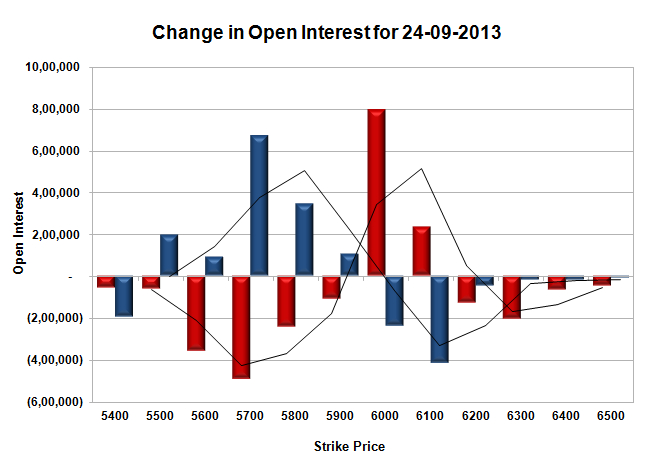 Best resistance is now at 6200, with huge OI of 41.40 lacs and above that at 6300 with OI of 36.85 lacs. 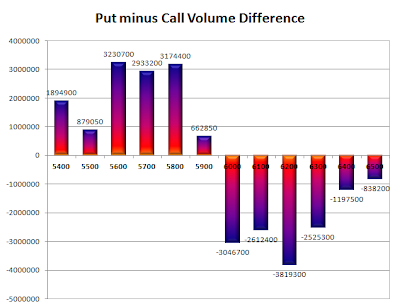 Day Range as per Option Table is 6007 - 6201 and as per VIX is 6037 - 6194 with 6099 as the Pivot. Nifty opened positive but dipped to the lows of 5840 and then stayed within a narrow range of 20-25 points for the better part of the day. A breakout during the dying minutes of trade saw the index move above 5900 to the highs of the day at 5916, but got adjusted to close just below 5900 at 5899.45, still a huge gain of 49.25 points. The broader though was just positive, with 683 advances to 634 declines. Only resistance of note is at 6000 in Option Table. 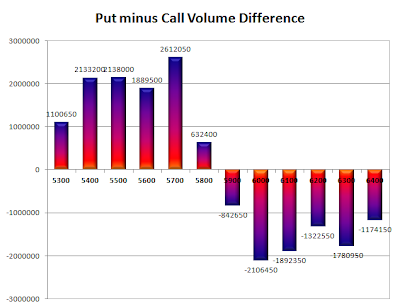 Call option 5900-6400 added 19.36 lacs huge amount of OI with short covering seen at 5800 and below strike price. Put option 5900-5500 added 20.91 lacs huge amount of OI with profit booking seen at 5400 and below strike prices. 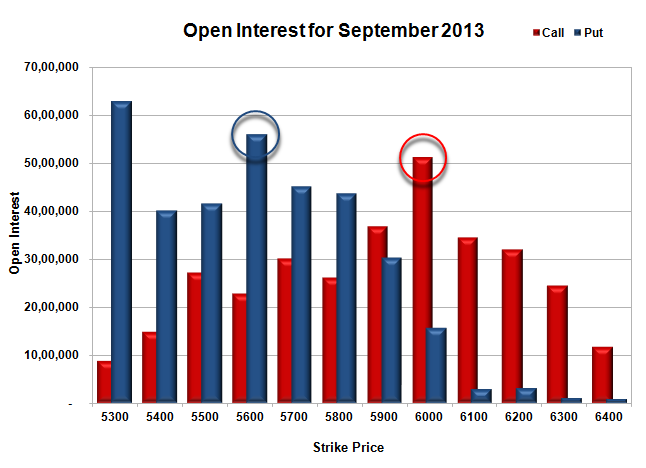 Nifty Open Interest is at 1,56,61,600 down by 3,05,550, with increase in price, most probably huge short covering. Bank Nifty Open Interest is at 20,07,175 up by 21,575, with increase in price, most probably long build-up. FII’s bought huge 2.34 lacs Futures, mostly long build-up, as their net OI increased by 19881 (includes 58917 longs and 54232 shorts) contracts and the average price per contract comes to around 5812.67. FII’s future open contract as on date is 452611. PCR Open Interest (Volume) is at 1.509. Initial support gaining strength at 5800, with OI now above 47.26 lacs, below that at 5700, with huge OI of 50.06 lacs. 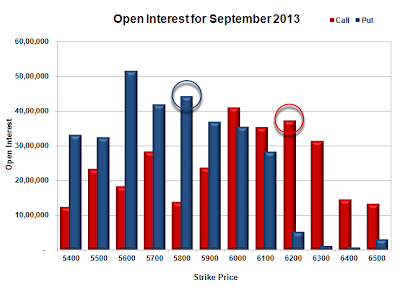 Best resistance at 6000, with huge OI of 56.47 lacs and above that at 6100 with OI of 39.39 lacs. Day Range as per Option Table is 5803 - 5976 and as per VIX is 5814 - 5985 with 5886 as the Pivot. Nifty opened weak and went on to dip around 5800 within the first few minutes, but saw the buyer coming back to avoid break of 5800 level. The index saw some lacklustre trading within a very narrow range of 30 points for the better part of the day and closed flat at 5850.20, a small gain of just 9.65 points. The broader market though was negative, with just 567 advances to 758 declines. 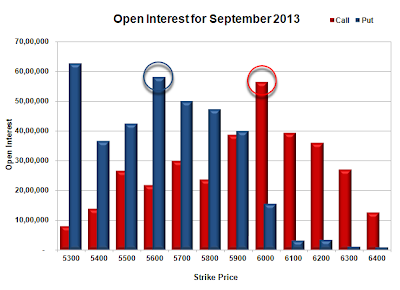 Based on Option Table, 6000 level is turning out to be good resistance for the series. 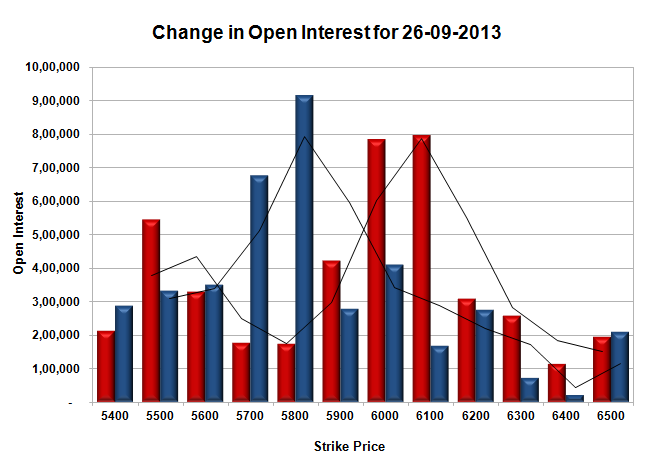 Call option 5800-6000 added 6.27 lacs huge amount of OI with profit booking seen at 6200 and above strike price. 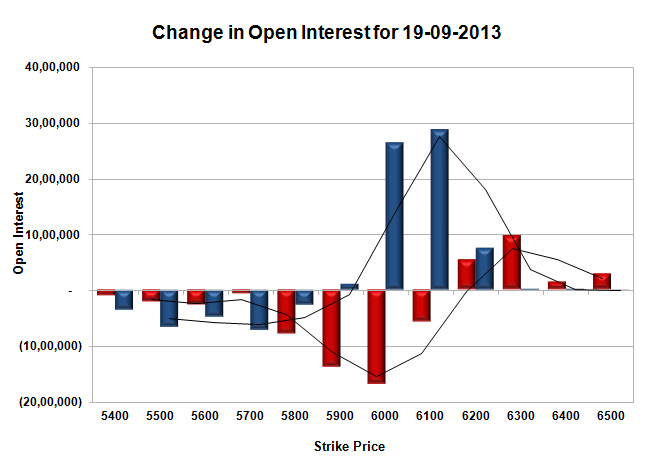 Put option 5900-5300 added 17.96 lacs huge amount of OI with not much change in other strike prices. 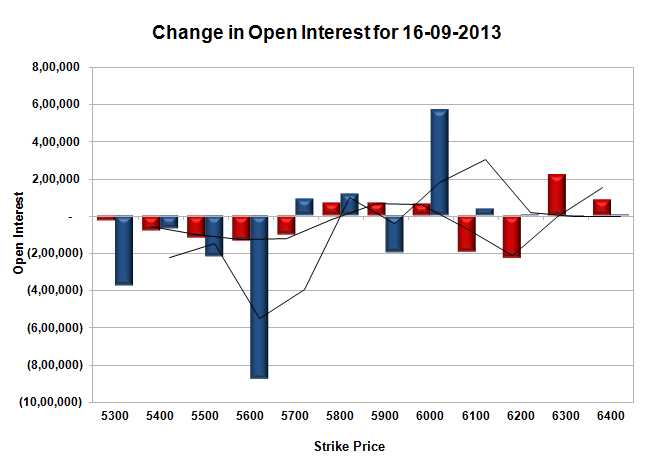 Nifty Open Interest is at 1,59,67,150 down by 8,44,800, with small increase in price, most probably huge short covering. Bank Nifty Open Interest is at 19,85,600 down by 18,050, with decrease in price, most probably some long liquidation. FII’s bought huge 10.06 lacs Futures, mostly short covering, as their net OI decreased by 20908 (includes 82429 longs and 62297 shorts) contracts and the average price per contract comes to around 5747.95. FII’s future open contract as on date is 432730. PCR Open Interest (Volume) is again back above 1.5 and now at 1.526. 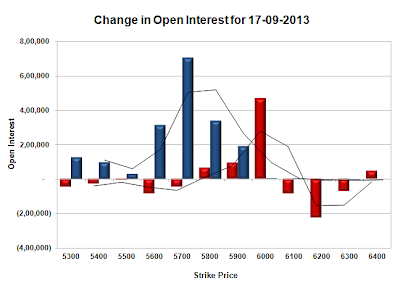 Initial support at 5800, with OI now above 43.73 lacs, below that at 5700, with huge OI of 45.12 lacs. 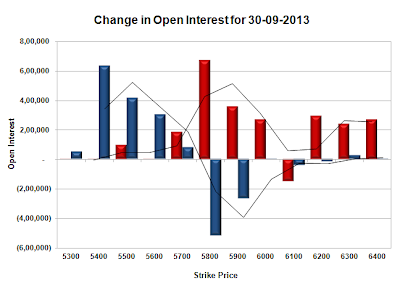 Initial resistance at 5900, though OI is just 36.89 lacs and above that at 6000 with huge OI of 51.28 lacs. Day Range as per Option Table is 5750 - 5932 and as per VIX is 5765 - 5936 with 5838 as the Pivot. Nifty opened huge up around 5930 and after a dash towards 5950 within the first few seconds, saw the responsive sellers take control of the proceedings. The index saw a drop of more than 150 points from the top to decline just below 5800 but saw some buying towards the end to close flat at 5840.55, a loss of just 10.05 points. The broader market was negative, with just 532 advances to 797 declines. Based on Option Table, the range till expiry right now is 5600-6000. 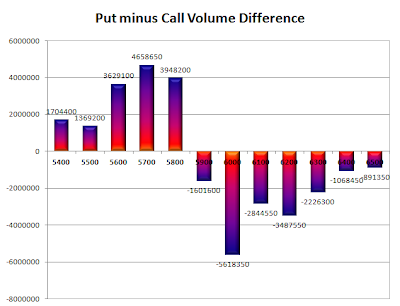 Call option 5800-6000 & 6300-6400 added 5.00 lacs huge amount of OI with short covering seen at 5700 and below strike price. Put option 6000, 5800-5700 added 7.74 lacs huge amount of OI with huge profit booking seen at 5600 and lower strike prices. Nifty Open Interest is at 1,68,11,950 down by 5,05,500, with not much change in price, most probably huge long liquidation/short covering. 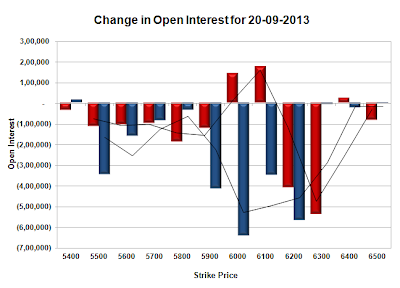 Bank Nifty Open Interest is at 20,03,650 down by 31,275, with increase in price, most probably some short covering. 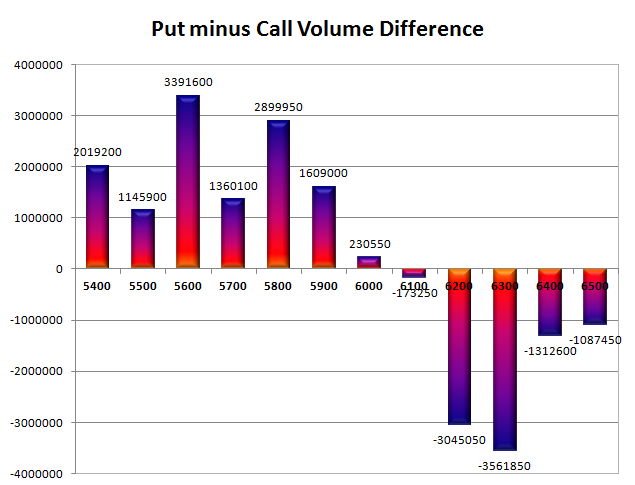 FII’s sold small 33,200 Futures, mostly short build-up, as their net OI increased by 10686 (includes 93535 longs and 94199 shorts) contracts and the average price per contract comes to around 5744.48. 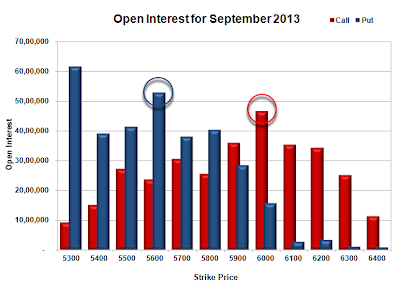 FII’s future open contract as on date is 453638. PCR Open Interest (Volume) is down below 1.5 after many days and now at 1.485. Initial support still at 5800, with OI now above 40.35 lacs, below that at 5700, with OI of 38.08 lacs. 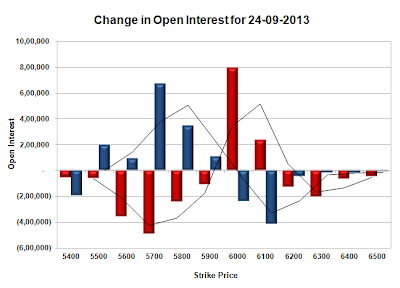 Initial resistance at 5900, with OI of just 35.33 lacs and above that at 6000 with huge OI of 46.61 lacs. Day Range as per Option Table is 5760 - 5958 and as per VIX is 5752 - 5929 with 5865 as the Pivot. 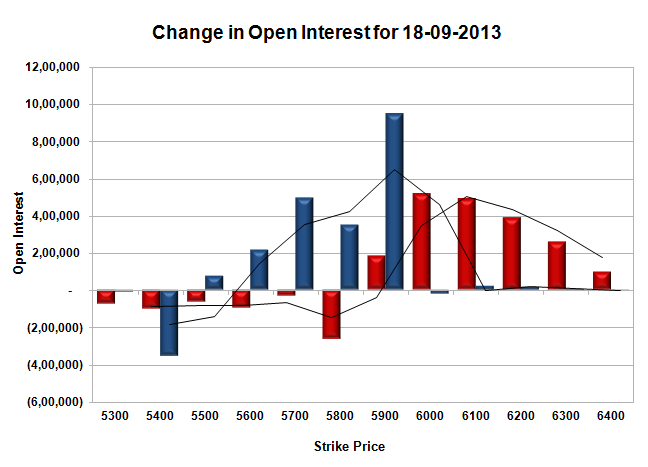 Nifty opened negative but saw buying within the first few minutes to move towards 5880. Thereafter the index stayed in a narrow range of 60 points throughout the trading session and closed flat at 5850.60, a change of just 0.10 points. On a week on week basis the index gained 170.20 points or around 3.0%. The broader market though was positive, with 808 advances to 529 declines. Based on Option Table, support is gaining ground at 5600 and resistance at 6000. 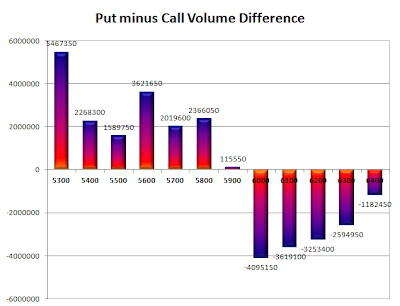 Call option 5900-6400 added 9.77 lacs huge amount of OI with huge short covering seen at 5800 and below strike price. 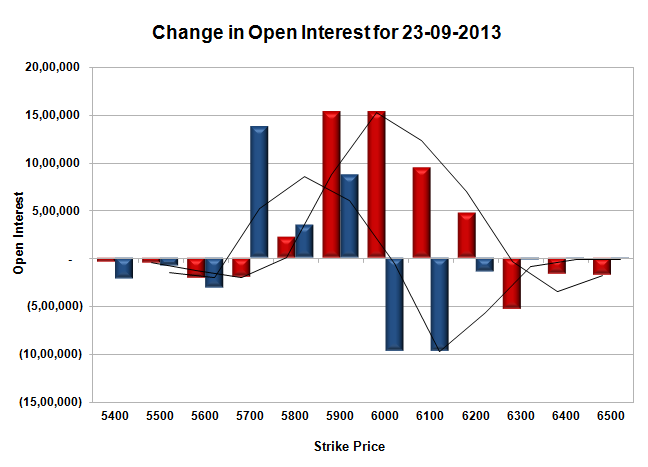 Put option 5900-5300 added 23.35 lacs huge amount of OI with not much change in other strike prices. Nifty Open Interest is at 1,73,17,450 down by 16,15,150, with not much change in price, most probably huge long liquidation/short covering. 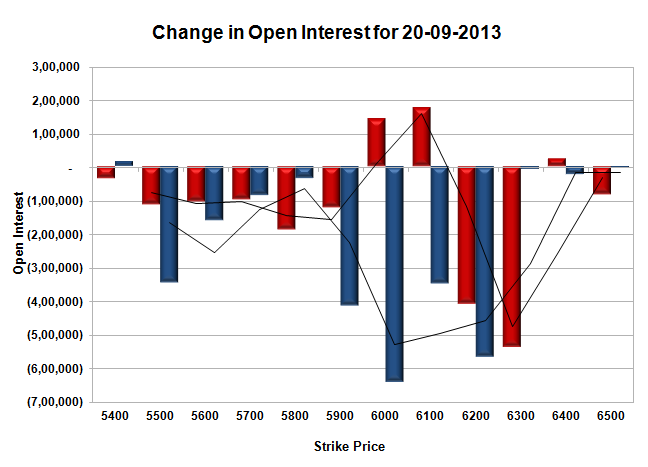 Bank Nifty Open Interest is at 20,34,925 up by 21,200, with increase in price, most probably some long build-up. FII’s bought small 4400 Futures, mostly short covering, as their net OI decreased by 38976 (includes 77902 longs and 77814 shorts) contracts and the average price per contract comes to around 5722.36. 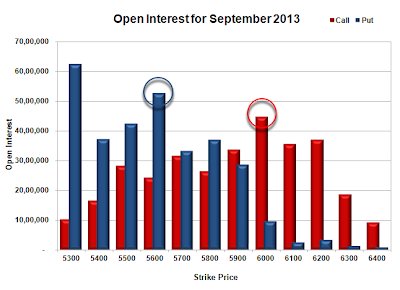 FII’s future open contract as on date is 442952. 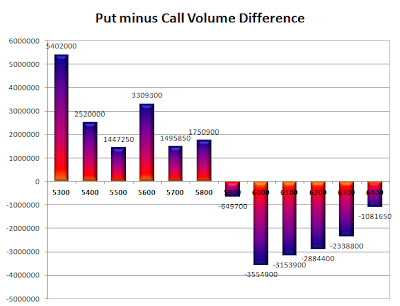 PCR Open Interest (Volume) went up to 1.522. 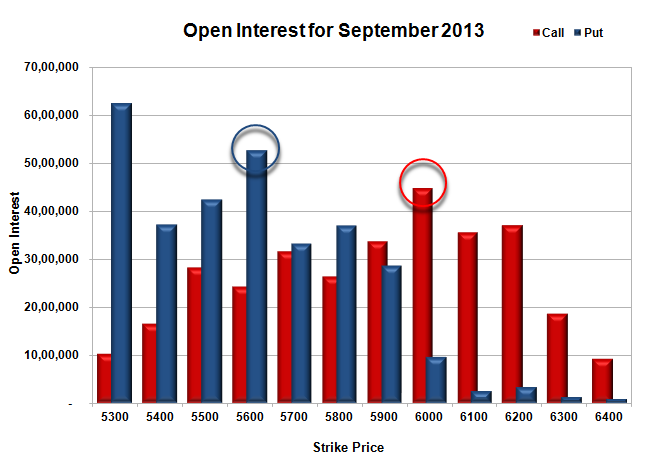 Initial support very much at 5800, with OI now above 39.18 lacs, below that at 5700, with OI of 37.19 lacs. 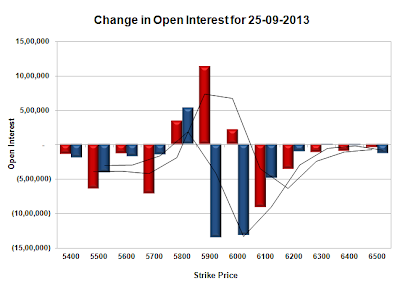 Initial resistance is still at 5900, with OI of 35.27 lacs and above that at 6000 with OI of 45.99 lacs. Day Range as per Option Table is 5755 - 5950 and as per VIX is 5764 - 5937 with 5853 as the Pivot. Nifty opened positive but saw the responsive sellers take charge to move the index down by more than 115 points from the top. A small pullback towards the end saw the index close at 5850.70, a huge loss of 62.45 points. The broader market was just negative, with 639 advances to 693 declines. 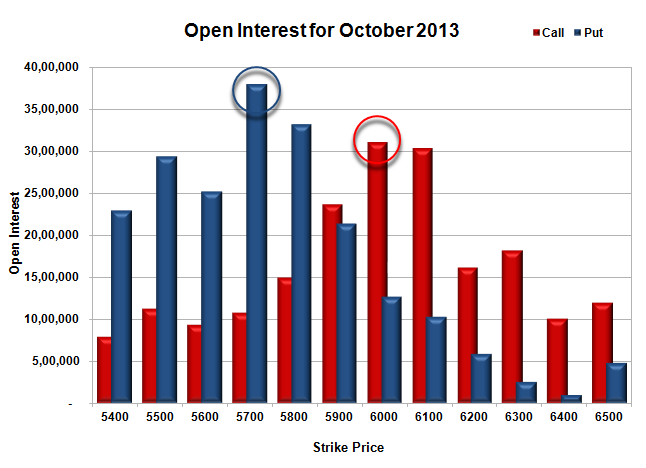 Based on Option Table, resistance at 6000 strike got better. Call option 6000-6400 added 20.08 lacs huge amount of OI with huge short covering seen at 5800 and below strike price. 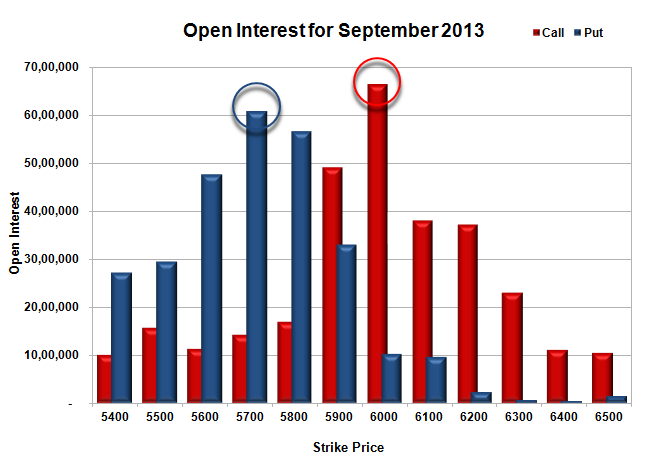 Put option 5900, 5600-5500 added 8.67 lacs huge amount of OI with profit booking seen at 5700 and 5300 strike prices. 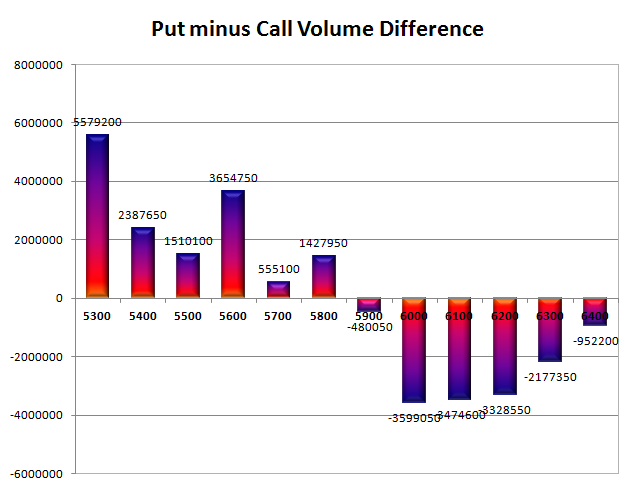 Nifty Open Interest is at 1,89,32,600 down by 1,73,150, with huge decrease in price, most probably huge long liquidation. Bank Nifty Open Interest is at 20,13,725 down by 30,025, with decrease in price, most probably long liquidation. FII’s sold huge 6.17 lacs Futures, mostly short build-up, as their net OI increased by 23355 (includes 65417 longs and 77758 shorts) contracts and the average price per contract comes to around 5719.06. FII’s future open contract as on date is 481928. 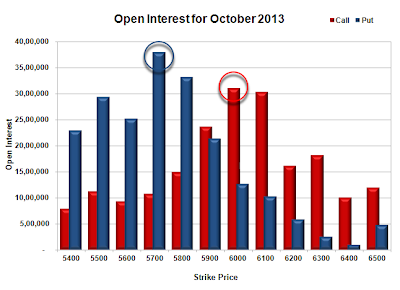 PCR Open Interest (Volume) is dipping fast and now at 1.508. Initial support still at 5800, with OI now above 36.99 lacs, below that at 5700, with OI of 33.18 lacs. 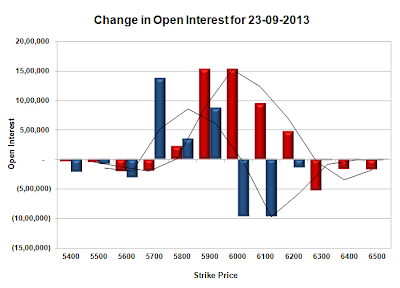 Initial resistance at 5900, with OI of just 33.80 lacs and above that at 6000 with OI of 44.68 lacs. Day Range as per Option Table is 5757 - 5969 and as per VIX is 5760 - 5942 with 5866 as the Pivot.